It happens to everyone, or so Lou told himself. Every day in this city, someone takes a wrong turn on a walk he’s taken a hundred times. Sooner or later, everyone is bound to take the wrong short cut between the wrong two Chinese restaurants and end up lost. Only Lou didn’t know of any wrong turn anyone could take off Broad Street that ends up in a burnt out expanse the size of a pair of football fields. When he looked behind him, he could see one of the Chinese restaurants and the street he’d been walking down. When he looked ahead, he was looking at the crater of some tragic explosion. Past it, he could see the hazy outline of South Street, but only barely. To his left, where the subway entrance should have been was a hut, a building not much taller than twenty feet. He walked closer, against his better judgment. The hut appeared to be pulsing or breathing. One step closer and he could see it was pulsing because it was made entirely out of skin—the skins of people all grown together, but still alive. He screamed, and the skinless things that belonged there came to the sound, like bees to honey. The Collection of Horrors is an anthology of Storyteller tools inspired by the Horror Recognition Guide that you can either use in conjunction with the Guide or as part of your existing Hunter: The Vigil chronicle. You can get a free introduction here. Each story kit in the Collection of Horrors (which you can buy individually, as a bundle or as a subscription) contains variety of appropriate tools; usually an SAS scene, a character with a character sheet, and props ranging from maps and reports to print out and hand to your players, to short imbedded audio files that you can play at your gaming table. These kits represent a collection of evocative story tools that you can write a story around, drop into an existing SAS or even string together. They aren’t stories in their own right, but rather pieces that you can snap together into whatever shape you want. 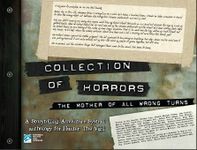 Using the Guide can add even more props and ideas to this anthology, but it’s not required to use the various story kits in the Collection of Horrors.